It’s hard to believe that it has been three years since Gearbox Software’s Borderlands created a smash sensation just by merging two long-running gameplay tactics — shooting and looting. With the long-awaited Borderlands 2, Gearbox has upped the ante and delivered the goods just like any proper sequel should: by keeping what worked so well before while also refining the overall experience. 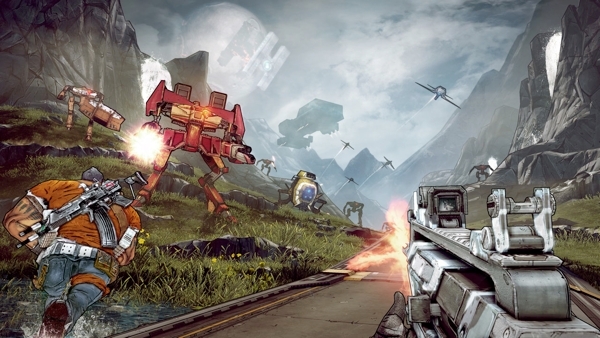 Using the same gorgeous cel-shaded visuals that impressed the first time around, Borderlands 2 begins five years after the ending of the first game. Four new Vault Hunters are introduced, and they are on a mission to find new villain, Handsome Jack, who has taken over Pandora and is ruling the land with an iron fist. Just like before, each hunter has their own traits. There’s Salvador, the Gunzerker, who is an absolute brute that becomes especially dangerous when holding two guns. There’s Maya, the Siren, who can suspend enemies in midair, making them easier to target. There’s Axton, the Commando, who has the unique ability of making turrets appear out of nowhere, mowing down anything in sight. Finally, there’s Zer0, the Assassin, probably the most used character this time around. He has the ability to go invisible for a short period of time, allowing for deadly sneak attacks or other stealthy actions. Each character offers a different playthrough experience, and they can even be tweaked via skill points to allow for greater customization. For example, Zer0 can be built into an impeccable sniping marksman or a melee fiend, depending on your personal preference. With four unique characters (and a fifth now available via DLC), the amount of depth and replay value in the game is staggering. 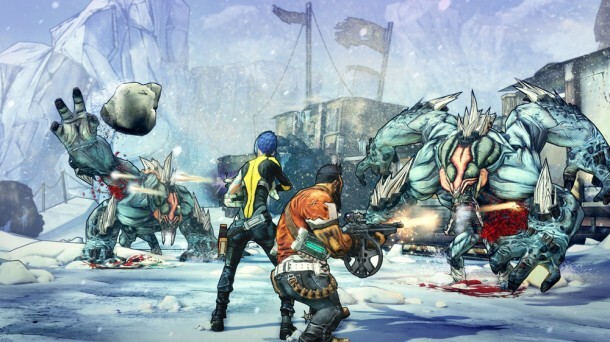 While Borderlands 2 can be played on your own, it undeniably works best as a co-op adventure. With up to four players, the game becomes an absolute blast while working together, especially if each user has a different character. Tag-teaming enemies by suspending them in air via Maya’s “Phaselock” and then throwing down Axton’s turret is a thing of beauty. Playing with others also increases the difficulty and the chance of finding better loot, allowing characters to level up faster. When playing with friends, there is little to no monotony while traversing the expansive Pandora, and it’s fun to even go back and replay missions just for the communal experience. Again, this still works quite well in single player, but this is arguably the best co-op experience of the year. Borderlands 2 offers well over 100 quests in total, and the rewards for completing them include cash, weapons or other forms of loot. It’s always a rush to finish a quest or two then turn them in to hear the familiar “cha-ching” sound. In fact, searching the environments for any and all types of loot can be an absolute addiction. Any box, locker, barrel or even port-a-potty that has a green light on it can be searched for new goods. Oftentimes these will only have a few dollars in cash or ammo, but every now and then it’s possible to come across a new, badass weapon. There’s no greater joy than discovering that an enemy dropped a rare, orange gun that is better than anything else you own. 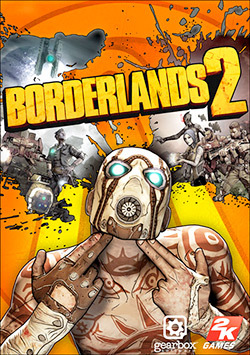 Seriously, if you have any addiction to Diablo or other hack ‘n slash looters, Borderlands 2 will consume you. I would be remiss if I did not mention the game’s improved writing and overall storytelling. The original lacked true narrative substance and didn’t have very many memorable characters. That’s not the case at all here, as new writer Anthony Burch has penned a more rewarding plot with even more humor than before. The new villain, Handsome Jack, is hilarious as he randomly appears over the in-game communication system just to verbally abuse the Vault Hunters. Old favorite, Claptrap, the peculiar little robot, is back and full of even wittier banter than before. Other new characters such as the English gentleman, Sir Hammerlock, and the 13-year-old ball of terror, Tara, are quite memorable. Now, while the writing is improved overall, it occasionally dabbles into low-grade humor that appears to have been included with teenagers in mind. For example, there is one sidequest that involves hunting down a particular monster species in hopes of coming up with a new name for them. One name suggestion? “Bonerfarts.” Yeah. Moments of immaturity aside, there are some rewards within the writing, particularly when you stumble across any of the countless hidden Easter Eggs. From references to the Teenage Mutant Ninja Turtles, Breaking Bad, the Double Rainbow Guy and the Skyrim “arrow to the knee” meme, there are endless bits of pop culture references scattered throughout. It’s a real treat finding them all. 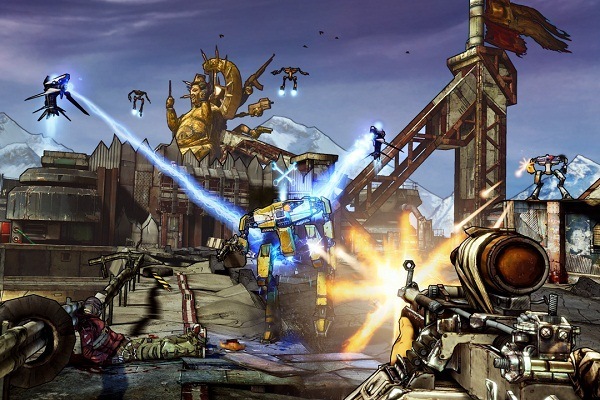 Aesthetically, Borderlands 2 also offers a number of improvements. The cel-shaded visuals are even more beautiful than before, especially when it comes to viewing the landscapes far off in the distance. An early area takes place in a cold, icy environment with large icebergs in the background. Looking up at the star-filled sky is always fun, especially when observing the full moon with a space station nearby. The game owes a great deal of its charm to its graphical appearance, and it does not disappoint at all. The voice acting is also noticeably better this time, and the music hits all the right notes. 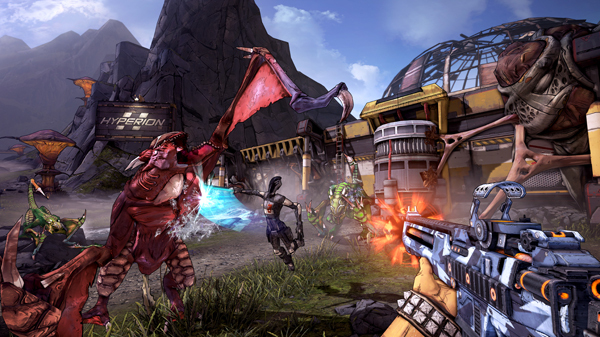 In short, Borderlands 2 has all the makings of a strong “game of the year” candidate. Right now, I would be hard pressed to find something better. Its flaws — such as the occasional juvenile humor, and a somewhat overlong tutorial — are incredibly minute in the grand scheme of things. If you have friends to play this with, purchasing Borderlands 2 is a no-brainer, and it comes highly recommended even when going solo. Now, if you’ll excuse me, I need to get back to looting. Thanks, Scott. The first Borderlands is pretty cheap now and is absolutely worth playing if you get a chance. Both of them are great, great games. Couldn’t agree more mate, absolutely loving this game. Great review. Thanks, Greg. It sure is addictive, eh? It’s not often that I finish the main storyline of a playthrough and go back to the game. Borderlands 2 has fantastic replay value for a game that will take at least 30 hours on your first time through. While I’m not sure it will be my game of the year, it is one of my favorites. Highly Recommended. Absolutely, Max. I can see myself playing through this with multiple characters. So addictive. Just curious — what would you have pegged as your game of the year so far? Great review man, and I obviously agree with your conclusion. Game is just great, and I really need to get back to it to finish my first playthrough. It’s definitely in the running for GOTY. There’s some big games coming, and frankly, I’m so hyped for AC3 that unless it just turns out way below my high expectations I’d be surprised if anything else won out for me. Borderlands (and XCOM) are riding at the top of the list for now though. Thanks, man. I’m sure I’ll be playing Borderlands 2 for a while now, especially with new DLC already on the way. AC3 does look pretty awesome. I still need to check out AC2, but I’m a little wary after not enjoying the first one barely at all. I keep hearing the sequel(s) is a huge step up in quality, so I should probably give it a chance.